Santa Maria del Mar was built in 1329-83 by architects Berenguer de Montagut and Ramon Despuig on behalf of the guilds of the Ribera quarter. The rose window was destroyed in an earthquake in 1428 and the replacement was completed in 1459-60. The north-west tower was added in 1496 but the south-east tower was only added in 1902. The first record of an earlier church on the site is from 998. The renaissance facade of the Palau de la Generalitat was designed by Pere Blai in 1596 and was completed around 1602. The columns flanking the main entrance are possibly ancient Roman in origin, while the statue in the niche above was created in 1860 by Andreu Aleu i Teixidor and added to the facade in 1872. The oldest parts of the building date from the early 15th century, when an existing structure was acquired for use as seat of the Catalan Parliament, the Corts Catalanes. Gothic elements are to be found in the central courtyard and the facade on the narrow street Carrer del Bisbe, which used to be the principal facade. Further work was carried out on the facades of Carrer Sant Honorat and Carrer Sant Sever in 1610-30 by Pere Ferrer and his son. Restoration work was carried out in the 19th and early 20th centuries and a neo-gothic bridge across Carrer del Bisbe was added in 1928. 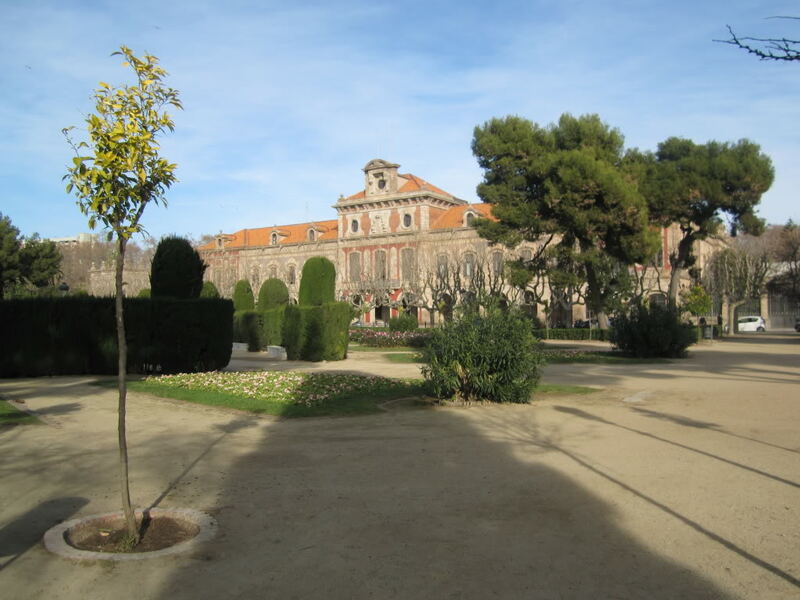 The former arsenal is one of three remaining buildings of the citadel, which the Spanish king had built after the War of Spanish Succession to control the population of Barcelona. construction took place between 1716-48 under the supervision of the Flemish military engineer Joris Prosper van Verboom. It was demolished in the late 19th century to make way for the Parc de la Ciutadella, the site of the 1888 Universal Exhibition. The other remaining buildings are the parish church and governor's residence. The arsenal was converted into royal palace in 1889 and some alterations were made by architect Pere Falques, but the building was soon diverted to another purpose and extensions completed in 1915 were for a museum. 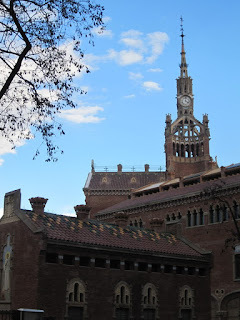 It became the seat of the parliament of Catalonia in 1932, a function it regained in 1980. 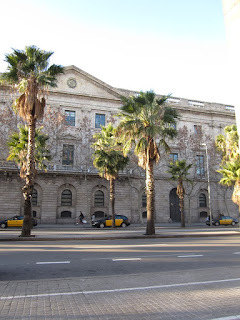 The facade of Palau de Bisbe on Placa Nova was created in 1782-84 to a design by Josep Mas i Dordal. The building is originally from the 13th century, with alterations and extensions from 1681, 1769, the beginning of the 19th century, 1909 and 1928. It is the seat of the arch-bishop of Barcelona. The building is adjacent to the remains of the principal gate to the ancient Roman city of Barcino. La Llotja was originally built in the 1380s but was remodelled in to a neo-classical facade in 1774-1802 by architects Joan Soler i Faneca and Tomas Soler i Joan Fabregas. It housed the city’s stock exchange until 1994 and the original gothic hall was formerly used as the main trading room. The building is now used by local government offices. 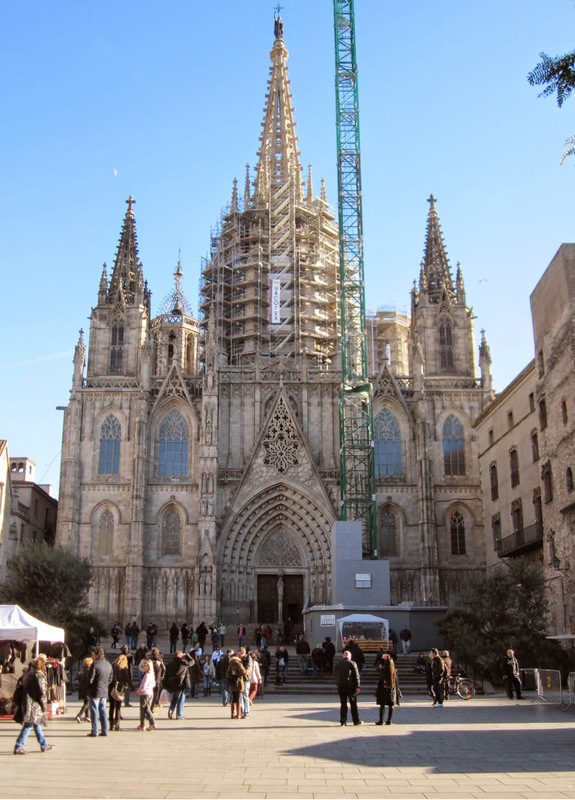 The principal facade of Barcelona cathedral is based on a design from the early 15th century by the French architect Charles Galters, but was only completed in 1913. The work was sponsored by the financier Miguel Girona i Agrafel and the architect Josep Oriol Mestres was appointed to the task in 1855. The facade was completed in 1898 while the central spire was finished in 1913. Work on the cathedral was originally begun in 1298 and ended in 1417, the cloister was added in 1448. The gothic church replaced a romanesque cathedral from 1058, while an even older church was built in the 6th-7th century. A baptistery existed on the site as early as in the 4th century. Castell dels Tres Dragons is the popular name given to the cafe-restaurant building built in 1887-88 to design by Lluis Domenech i Montener for the 1888 Universal Exhibition. The building was delayed and only opened 4 months after the inauguration of the exhibition leading the architect to resign from the commission. The buildings on Passeig de Picasso were built in the 1870s, to a design by architect Josep Fontsere i Mestre, inspired by Rue de Rivoli in Paris and the Porxos d'en Xifre building (1836-40) at Placa de Palau. 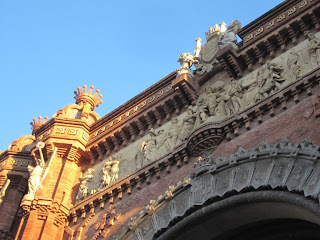 The Arc del Triomf was built for the Universal Exhibition of 1888. It was designed by Josep Vilaseca i Casanovas, and is partly based on the Spanish mudejar style. The frieze was executed by Josep Reynes. 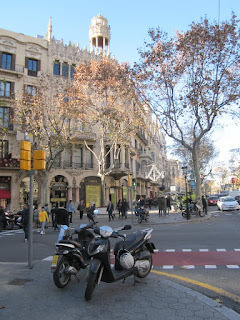 Passeig de Gracia is one of the city’s main avenues and probably the widest. It began as a semi-rural road from Barcelona to the formerly separate town of Gracia. Urbanisation plans began in 1821 but was disrupted and taken up again in 1827. By the beginning of the 20th century, it had become the most fashionable street in town. This image shows a row of buildings, belonging to the city block dubbed the Illa de la Discordia, referring to the clash of styles. It includes three of the most famous Moderniste (Art Nouveau) buildings in Barcelona: Casa Batllo by Antoni Gaudi, Casa Amatller by Josep Puig I Cadafalch and Casa Lleo Morera by Lluis Domenech i Montaner. It also includes Casa Mulleras by Enric Sagnier and Casa Bonet by Marcel-li Coquillat i Llofriu. The current design of Casa Lleo Morera is the result of a redesign of a house from 1864 known as Casa Rocamora. The house was remodelled in 1902-06 to a design by the architect Lluis Domenech i Montaner, who collaborated with several artists including Lluis Bru, Mario Maragliano, Eusebi Arnau, Antoni Serra i Fiter and Gaspar Homar. The other artists were responsible for the design of individual elements such as the mosaics, sculpture ceramics and furniture. The building was restored in the 1980s, which brought back some integral elements to the design including ground floor, mezzanine and corner tempietto. Casa Batllo, also known as Casa dels Ossos (House of Bones), is the result of a redesign of of a building from 1877. The design is one Antoni Gaudi's most famous works and was completed in 1904-06. Josep Batllo originally intended to demolish the existing building but was dissuaded by Gaudi to keep the original structure. 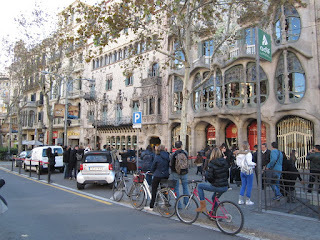 On the left stands Casa Amatller, redesigned by architect Josep Puig i Cadafalch in 1898-1900. Casa de las Punxes was completed in 1905 to a design by the architect Josep Puig i Cadafalch and is located on the Avenida Diagonal. The work was completed on behalf of the Terrades sisters who wished to remodel three existing buildings into one unified design. Casa Mila, also known as La Pedrera, was built in 1906-10 to a design by Antoni Gaudi. 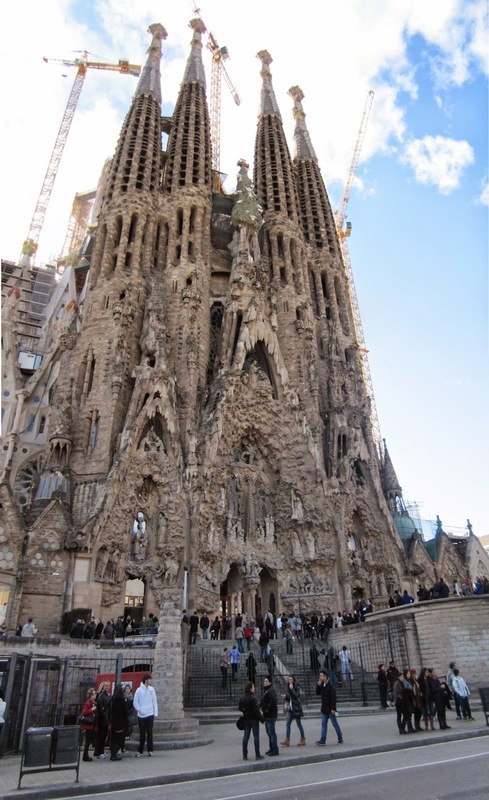 Some aspects of Gaudi's design had to be removed as they violated the city's building codes and height restrictions. Some aspects may also have been considered too overtly religious. The building had the city’s first underground car park while the iron work balconies were created by Josep Maria Jujol. The previous building on the site was demolished, unlike in the case of Casa Batllo where Gaudi redesigned an existing building. Sagrada Familia seen from Carrer de Provenca. The image shows the apse and parts of the passion façade. The apse is the oldest part of the building, while the passion façade was only completed in the second half of the 20th century. The towers were completed in 1976, and sculpturing began in 1987. Decorations by Josep Maria Subirachs are very different from Gaudi’s nativity façade and is rather austere with it’s cubic and angular figures. This seems to be in accordance with Gaudi’s original wishes, and makes sense given the subject matter: the death of Christ. The nativity façade was constructed between 1894 to 1930. It depicts the birth of Christ and symbolically faces the rising sun. 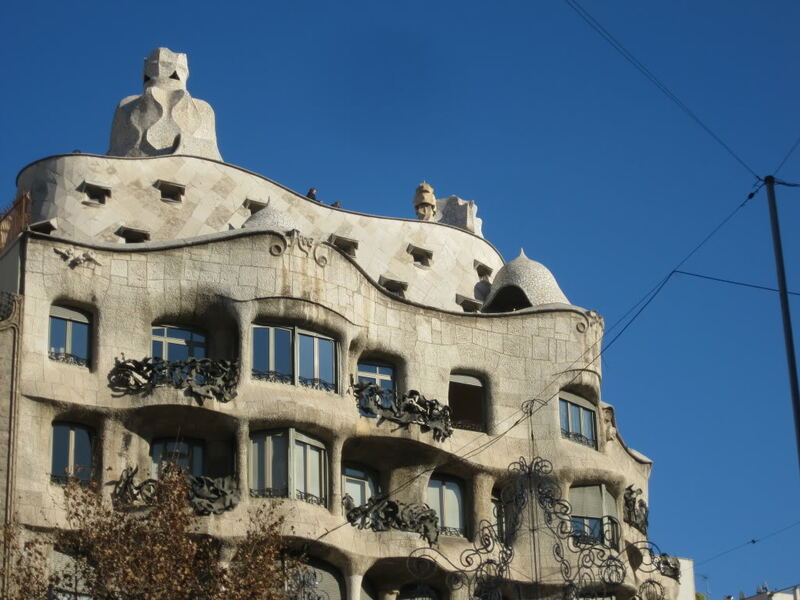 As is typical of Gaudi’s style, the façade features a lot of shapes drawn from nature. 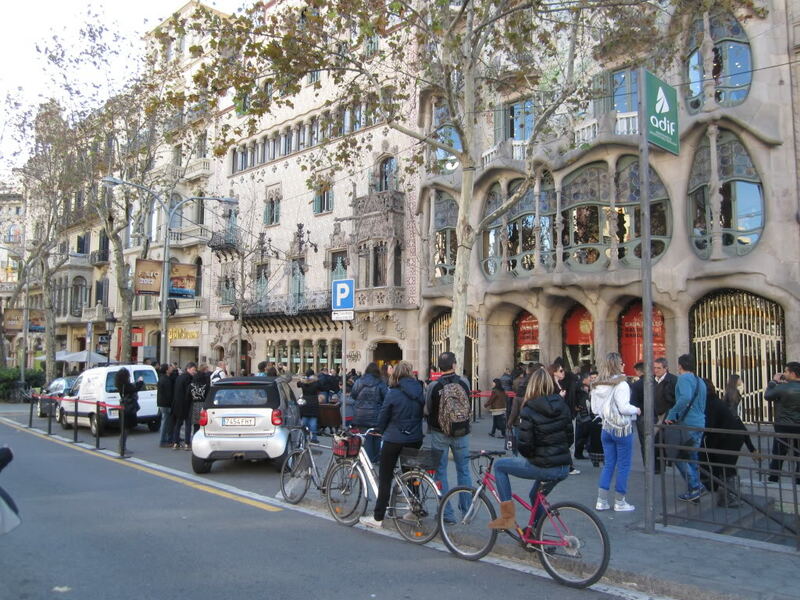 Gaudi even intentioned the façade to be painted, but this is unlikely to ever happen. The Temple Expiatori de la Sagrada Familia was originally conceived as a neo-gothic project designed by Francisco de Paula del Villar. 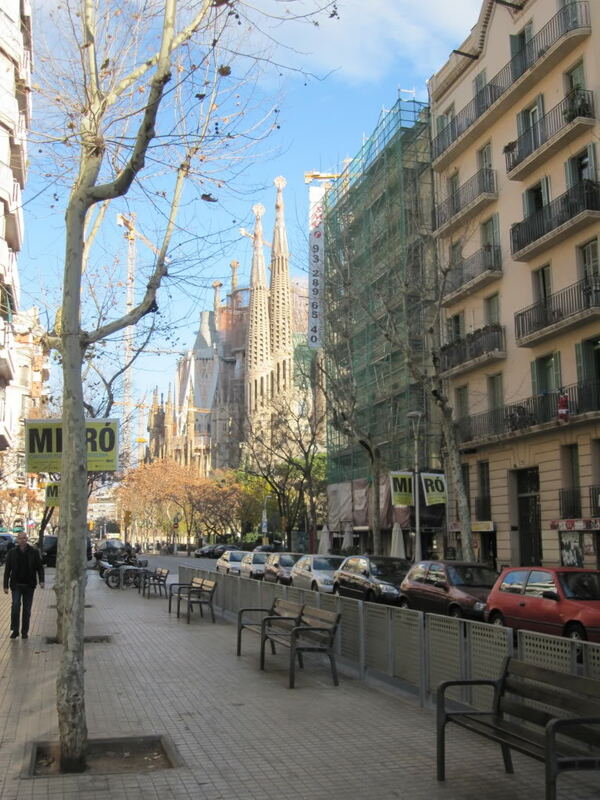 Work started in 1882 but passed to Gaudi the following year. Construction is still ongoing. Nonetheless, the church was consecrated in November 2010 and is expected to be complete by 2026 or 2028. The Hospital de la Santa Creu i de Sant Pau was begun in 1902 according to the designs of Lluis Domenech i Montaner. The complex was completed in 1930 by his son. The combination of gardens, pavilions, colour and art was designed to have positive therapeutic effects. Via de Laietana is a major thoroughfare cutting through the old town in Barcelona, with Barri Gotic to the west and El Born/La Ribera and Sant Pere districts to the east. It was created between 1907 and 1926 and necessitated the demolition of a large number of houses, some of which stretched back to the middle ages. The street is named after the Laietanii, a people that inhabited the Barcelona area. The building shown in the picture was completed in 1912 to a design by Joaquim and Bonaventura Bassegoda i Amigo. At the end of Via Laietana at Placa d'Antoni Lopes, stands the Edifici de Correus (central post office) designed by architects Josep Goday and Jaume Torres. It was built in 1926-29, after a drawn out planning process that began in 1914. The Palau Nacional was the main building of the 1929 International Exhibition and was designed by architects Eugenio Cendoya and Enric Cata, who won a competition in 1924. The idea of crowning the Montjuic hill with a temple of art was suggested in 1909 by Manuel Vega. The decision to use the site to host an exhibition was taken in 1913 and the architect Josep Puig i Cadafalch proposed the initial plan in 1915. Construction of a domed palace to his design was begun in 1923 but by the end of the year work was suspended and Puig i Cadafalch lost the commission due to political reasons. 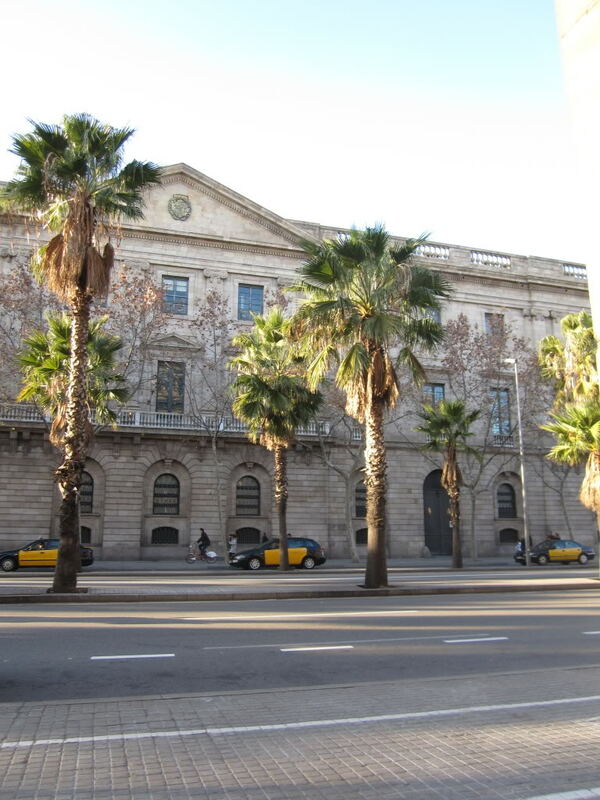 The building has been the national art museum of Catalonia since 1934. Placa d'Espanya was designed in 1915 and was completed for the 1929 International Exhibition. The fountain in the centre was designed by Josep Maria Jujol and Miquel Blay. The pre-existing bullring was built in 1900 and has now been converted to a shopping centre. The Venetian tower modelled on the campanile of St. Mark's basilica in Venice marks the entrance to to the exhibition district. Palau Sant Jordi is an indoors sporting arena built for the 1992 Summer Olympics. It was designed by the Japanese architect Arata Isozaki and opened in 1990. The venue hosted gymnastics, handball and volleyball. It is also used for concerts and cultural activities. The Montjuic Communications Tower, also known as Torre Calatrava and Torre Telefonica, was designed by the architect Santiago Calatrava and built in 1989-1992. It was built to transmit the television coverage of the 1992 Summer Olympics and symbolises an athlete holding the Olympic torch. The 154-metre tall Hotel Arts was completed in 1994 to a design by Skidmore, Owings and Merril. Unlike the nearby sculpture designed by Frank Gehry, it was not built for the 1992 Olympics. It shares the distinction as tallest building in Barcelona wit Torre Mapfre, built i 1991-92 to a design by Inigo Ortiz and Enrique de Leon. Torre Agbar is the third tallest building in the city, designed by Jean Nouvel and b720 Fermin Vazquez Arquitectos and built in 1999-2004.